Infor has over 70,000 customers in more than 200 countries and territories. Customers use Infor’s ERP products to improve operations, drive growth, and adapt to changes in business demands. 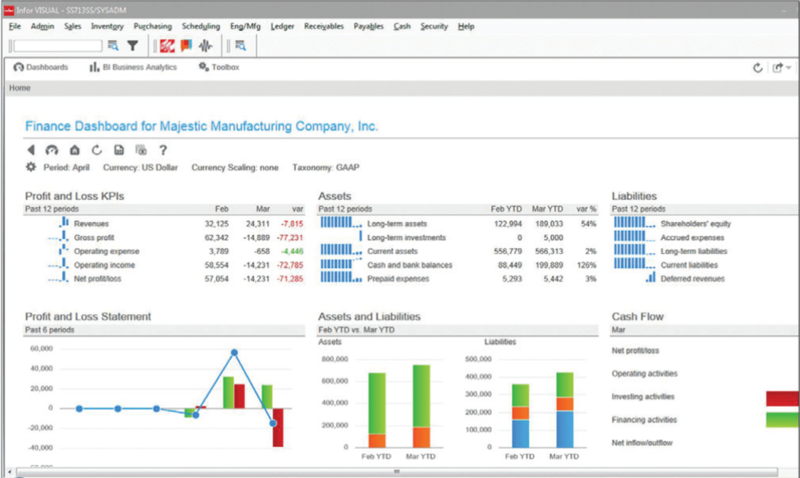 Infor offers industry-specific applications and suites in a number of software verticals. Infor VISUAL is a scalable, manufacturing-centric ERP solution that delivers end-to-end functionality for a diverse range of manufacturing businesses, and has over 4,000 customers around the world. As its name would imply, it is a highly visual manufacturing management solution. The graphical user interface allows for at-a-glance monitoring of each step of the manufacturing process and how they relate to one another, helping to resolve bottlenecks and boost the efficiency of your scheduling and pricing. Infor VISUAL is best suited for engineer-to-order, make-to-order, configure-to-order, make-to-stock, assemble-to-order, and mixed-mode manufacturers. Infor VISUAL is a business solution that embraces patented finite or lean (DBR) scheduling concepts with optimal throughput recommendations. It also is relatively easy to maintain and deploy, thanks to the availability of outsourced hardware and maintenance services. Manufacturers operating across multiple sites take heart — Infor VISUAL can be scaled and deployed to support all of your locations without requiring an additional database server. Infor VISUAL can help quickly convert customer requirements into manufacturing requirements and then execute them efficiently. The Lean manufacturing process, when implemented correctly, eliminates redundant or wasteful steps that can be associated with some non-Lean manufacturing software. While it is not inexpensive, the efficiency gained by working in one system delivers strong ROI. It is also priced by user, either individual or concurrent, allowing you to limit the total cost of ownership. Implementation averages four to six months. Not sure if Infor VISUAL is the best fit for your needs? Balking at the cost? Call and speak with one of our Technology Advisors today for a free consultation. Learn everything you need to know about Infor VISUAL. Our experts will reach out to you shortly.